The world’s easiest retail POS system. Six ways Vend’s point of sale system will help you grow your retail business. Sell more to your customers, in‑store and online. Vend is a beautifully designed, responsive point of sale system that makes it fast & easy to sell to your customers, and keep them coming back to your store. It works on iPad, Mac or PC, works online and offline, and connects to all the latest hardware – barcode scanners, receipt printers, cash drawers. Sell in-store with Vend POS system. Vend makes it easy to connect your brick-and-mortar store to the ecommerce you love. Connect your online store with Vend in minutes, and manage all your inventory and customer profiles from one place. Sync all your products in a click, fulfil orders easily and bring all your business operations into Vend, which gives you a global view. Sell online with Vend ecommerce integrations. Get paid quickly. Accept any type of payment. Accept credit & debit cards, and mobile payments from leading merchant providers around the world. Paypal, Worldpay, Square, or Tyro are just some of the credit card and mobile payment options available to you. Connect your Vend POS system to one of them, and you could be accepting card payments in minutes! Effortless product management. 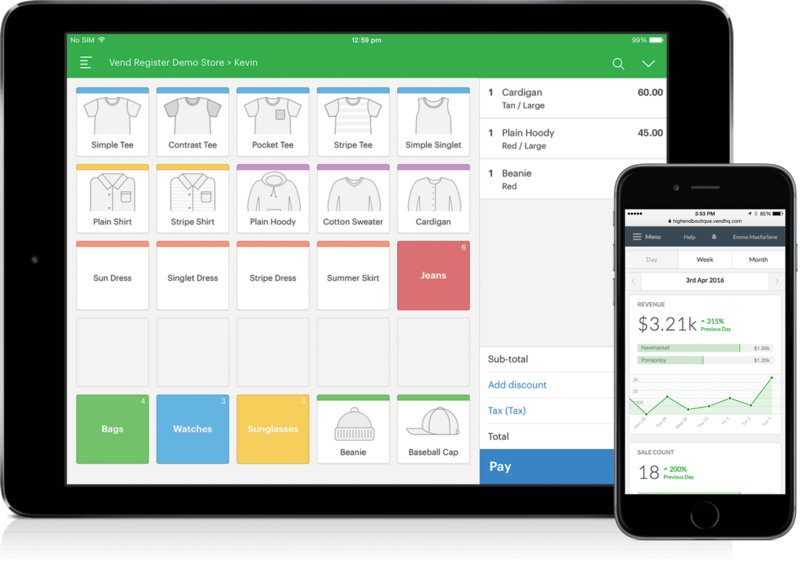 Whether you sell one SKU or thousands, with Vend, you’ll look forward to managing your catalog. Easily add cost and retail prices, tags, discounts, and perform bulk operations like import & export. Group products by color or size, organize into bundles, or split into units. Scan existing barcodes, or print new ones to speed up checkout. Take the POS to your customers. Repeat customers are the lifeblood of any retail business. Vend is mobile, so you can take your point of sale system onto the shop floor, beat the queues and build personal engagement with your customers. Or go truly mobile and hit the road to find new customers and markets. Reward customer loyalty. With a built-in loyalty program, the Vend POS system lets you save your customer details in seconds, or offer them incentives to sign up after they leave the store, then keep them coming back by rewarding repeat purchases. Grow repeat business with our loyalty program. Get to know your numbers. Then grow your business. Powerful reporting. 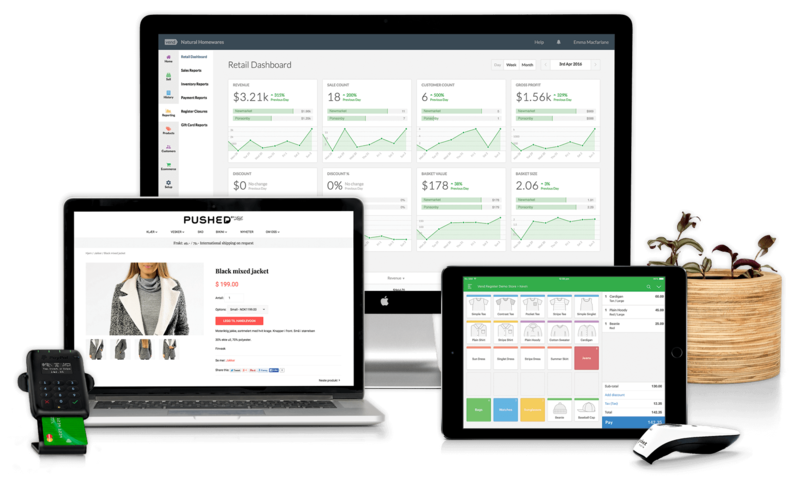 Retail is demanding, Vend Reporting helps you stay ahead of the competition by giving you an accurate view of sales and product performance, which you can access at any time. Drill deeper with insightful reporting tools into product, customer, inventory and staff performance, and quickly identify trends and areas to improve. Easily manage one store or hundreds. Build your retail empire from your armchair, by adding new stores and registers at the click of a button. Train your staff in minutes, and keep them motivated with daily, weekly and monthly targets. Then relax, knowing that your data is always safe, secure, and available when you need it. 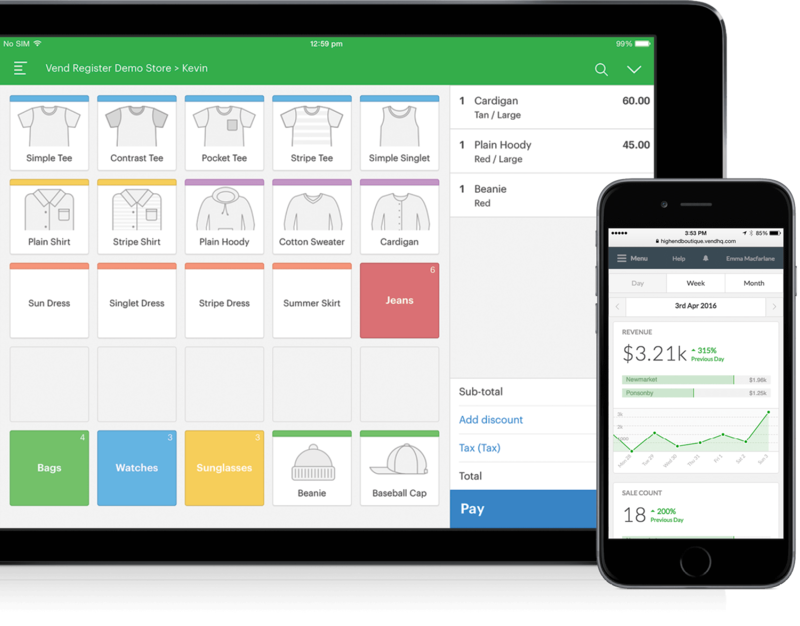 Know your business with Vend POS reporting. Get more done by connecting Vend to powerful add-ons. Take your business to the next level. Connect your sales, customer and product data in real time to a marketplace of business apps. Streamline and automate your retail operations, save hours of time each day, avoid double entering data, and trade seamlessly on multiple channels. Customize Vend with our API. Go even further and do anything you want with your Vend store, by building your own custom software solution on our world-class API. Our award-winning customer support is here to help 24/7. Really. We understand that retailers work hard, and at all hours of the day, which is why we provide support at all hours, all around the world. Don’t just take our word for it: check our current customer satisfaction levels. Frequently asked questions about our POS system. How much is the cost to switch to Vend’s POS system? How much time does it take to set up Vend’s POS system? Vend also offers professional services that include hands-free setup (where we take care of everything, including migrating products and customers) and one-to-one training. Contact us for more information. Alternatively, you can find a Vend partner in your area to provide on-site POS installation and account setup for you. Our partners are certified Vend POS experts who can get you up and running with the point of sale hardware, software, and add-ons you need to run your store. It’s very likely that Vend will play nice with the printers, scanners, credit card readers, and POS equipment you already have. We focus on making the software work with the best and most commonly used retail hardware and we’ve heard from retailers using Vend successfully with printers we’ve haven’t heard of. But to be sure, swing by our Recommended POS Hardware page for detailed specs on the hardware, peripherals, and computers compatible with Vend. I’m happy with my current POS system, why is Vend better for me? Most people who switch to Vend’s point of sale system never look back. Merchants love our POS software’s user-friendly and intuitive interface, as well as its features and integrations. You don’t have to take our word for it though; here are some examples of happy Vend customers and what they have to say about our POS system.